Former Turkish international footballer and former MP Hakan Şükür’s name has been removed from the Edirne Walk of Fame, which comprises the names of legendary football players embedded in the sidewalks along several blocks of Edirne’s Talatpaşa Avenue. 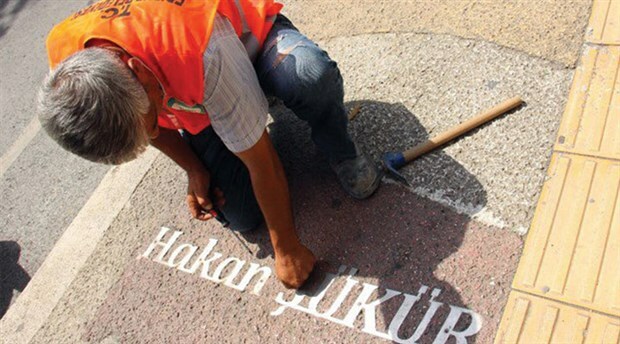 According to Turkish media outlets, a group of workers from the Edirne Municipality arrived at the avenue early on Wednesday and removed Şükür’s name, which was inlaid in brass block letters. Şükür is accused by the Turkish government of being a member of Gulen Movement. A striker whose football career stretched from 1987 to 2007, Şükür was by far the most prolific goal scorer in the history of the Turkish national side, finding the net 51 times in 112 appearances. This is not the first time Hakan şükür has been targeted by Turkiish authorities. On Aug 22, 2016, Turkish Football Federation (TFF) ordered the removal of the photos of Şükür from İstanbul Football Museum. According to Turkish media outlets, Galatasaray football club and Turkish Football Federation agreed to remove all the photos that belong to Şükür from İstanbul Football Museum and Galatasaray’s museum in Riva.